Now a Northwestern University team has developed a new tool that images blood flow through these tiny vessels, giving insight into this central portion of the human circulatory system. 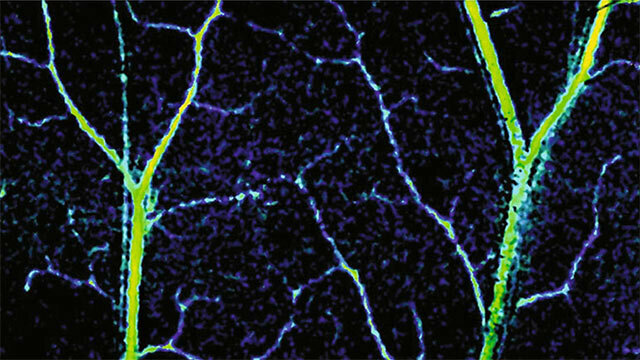 Called spectral contrast optical coherence tomography angiography (SC-OCTA), the 3-D-imaging technique can detect subtle changes in capillary organization for early diagnosis of disease. "There has been a progressive push to image smaller and smaller blood vessels and provide more comprehensive, functional information," said Vadim Backman, who led the study. "Now we can see even the smallest capillaries and measure blood flow, oxygenation and metabolic rate." The paper was published last week in the journal Light: Science and Applications. Backman is the Walter Dill Scott Professor of Biomedical Engineering in Northwestern's McCormick School of Engineering. He co-leads the Cancer and Physical Sciences Research Program at the Robert H. Lurie Comprehensive Cancer Center of Northwestern University.